As you are finalizing your semester, be sure to update your report cards in PowerSchool so that the right grade/GPA and teacher comments are pulled. To update your report card, navigate to: home page > system reports > setup > report cards > click the report card you want to modify. 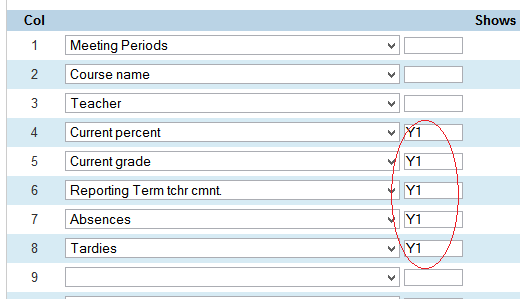 Next, make sure you update the store code for the grades, comments and percent as shown in the picture. We used Y1 since we are reporting yearlong grades. Use “S2” for Semester 2 grades only. Don’t forget to submit! This entry was posted in PowerSchool, Reports and tagged End Of Year, Grades, PowerSchool, Report Card. Bookmark the permalink.